Eyelash extensions are an exciting new product and technique that produce thicker, longer, and naturally abundant looking eyelashes through professional application of several individual synthetic eyelashes. These are directly attached to the natural eyelash with a specially formulated bonding agent and are made to appear identical to real lashes. The base is flat and the tip is fine and polished- just like real lashes! Eyelash extensions should be one-half to one-third longer than the natural lashes. When application process is done professionally, lashes may last up to 60-90 days depending on the natural growth cycle of your lashes. Most clients need a "fill" or touch up with in 2-3 weeks after initial application. Eyelash extensions are waterproof, sweat proof, you can shower and bathe, and sleep proof. Only 100% oil free cosmetics, lotions, and other items should be used on the eye area. The eyelash extension procedure is very relaxing and comfortable. A full set takes about 2-3 hours to complete. Someone receiving the extension service should be ready to relax and dress comfortably. 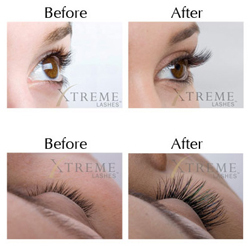 We only use Xtreme Lashes by Jo Mouselli...the BEST eyelash extensions on the planet! NEW! We now offer take home kits for our Herbal Aloe Body Wraps! Please visit our Products Page for more info.